Beautiful Feet. That was the theme of the World Missions Workshop when Wendell Broom (’45) brought it to the Abilene Christian University campus in Fall 1972. Footprints painted on sidewalks across the campus led students and visitors to Moody Coliseum. 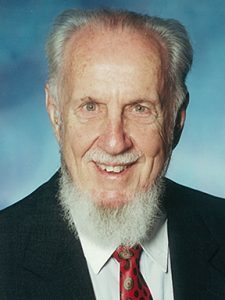 Broom died Saturday, Feb. 18, 2017, in Dallas at age 93, but his footprints can be found around the world in the mission fields where he served and in the lives of thousands of churches, missionaries and native preachers who were influenced by his life, work and pioneering development of missions as an academic program. Services honoring his life are Saturday, Feb. 25, at 2 p.m. at Lake Highlands Church in Dallas (9919 McCree Rd., Dallas, Texas 75238). Broom was born April 6, 1923, in Oklahoma City, Oklahoma, to Benjamin R. and Gladys Broom. He grew up there and attended Freed-Hardeman University, earning an associate’s degree in 1943 and a bachelor’s degree in history from ACU two years later, the first member of his family to graduate from college. While a student at Freed-Hardeman he met Betty Billingsley (’45), who also came to ACU. The couple married after graduation and began their lifetime of service to the church in Wilmington, Delaware, and Philadelphia, Pennsylvania, before accepting a call to the Nigerian mission field where they served from 1955-60. When the Brooms headed to Delaware, they took all their possessions in the back seat and trunk of their 1936 Chevy. Five years later when they moved to Nigeria they took their first four children – Wendell Jr., Mary Beth, David and Margaret – moving to a home with no electricity where water was hauled from a nearby river and meals were prepared on a wood-burning stove. Kathryn was born while they were there. Working with other mission families who joined the work, churches were planted, Nigerian ministers were trained and a fledgling Bible school begun by Broom’s predecessor, Howard Horton, in 1954 eventually grew to become Nigerian Christian Bible College. Upon returning to the U.S., the Brooms resumed their work with Elsmere Church of Christ in Delaware and then three years with Keeaumoku Street Church of Christ in Honolulu. After completing an M.A. in church growth from Fuller Theological Seminary, the Brooms moved to Abilene where he worked with Dr. George Gurganus to build the first missions department among schools affiliated with the Churches of Christ. As an ACU faculty member, Broom sponsored student mission organizations and taught annually in the Summer Seminar in Missions and Student Missions Workshops. He led the faculty spiritual reaffirmation in 1976-77 and conducted church growth studies of churches in Nigeria, Ghana, Kenya, Ethiopia, New Guinea, the Philippines, Thailand and Hungary. In addition to his faculty role at ACU, Broom taught summer or extension courses in missions at Nigerian Christian Bible College, Harding University, Pepperdine University, Ghana Bible School, Nairobi Great Commission School, and Addis Ababa Bible School in Ethiopia. ACU professor of Old Testament Dr. Mark Hamilton (’90 M.Div. ), said Broom was one of the rare people who exude faith, hope and love in every encounter of their lives. “I hope to live my life one half as well as Wendell lived his. That would be enough,” said Hamilton, whose wedding to Dr. Samjung Kang-Hamilton (’88 M.R.E.) was officiated by Broom. Broom served as an assistant professor of missions until his official retirement in 1988 but continued to teach missions classes until 1992. The next January he left for six months of teaching in Siberia. In “retirement” he continued an active teaching role in the mission fields, traveling to China, Kenya, Zimbabwe and the Pan American Lectures. He and Betty took each of their 11 grandchildren on international trips. In 2001, ACU Press published 100 Years of African Missions: Essays in Honor of Wendell Broom. In that volume, Dr. Gailyn Van Rheenen, professor emeritus of missions, wrote an essay titled “Archery, Dentures, and Eagles: Missionary Metaphors of Wendell Broom,” an exposition on Broom’s gift for drawing fresh metaphors to clarify biblical priorities. Broom was preceded in death by his parents, his brother Charlie Broom (’51), and son-in-law Glen David Adams (’72). He is survived by his wife, Betty, and their six children: Wendell Jr. (’74 M.A.) and his wife, Sharon (Beaty) Broom; Mary Beth (Broom ’72) Best and her husband, LeRoy Best; David Broom (’75) and his wife, Marvis (Adams ’74) Broom; Margaret Broom Adams (’77), Kathryn (Broom ’80) Mick and her husband, Kenneth Mick; Jonathan Broom (’83) and his wife, Amelia Broom; Linda Cotham Broom; 11 grandchildren; and 11 great-grandchildren. View more from Cheryl Bacon. Wendell loved ACU with all of his heart, and we know he is missed there, but if you want to be reminded of him, just glance up at the angel on the bottom rung of the Jacob’s Ladder sculpture!! Uncle Wendell filled the room-with more than his physical stature, but also with joy that was truly from the Giver of all that was good and pure. He and Aunt Betty managed to rear a house full of precious kids in the midst of changing social mores and I am blessed to have had the opportunity to have loved them all. Be blessed in the knowledge that in a little while, on God’s scale, we will see him again! !